No Amateur Radio Station is complete without a mechanism for measuring forward and reflected power. Transmit into an antenna with too much reflected power (high SWR) and you endanger your output tubes or transistors. We all know this, and that’s why I have been in search of late for a fully-functioning SWR Power Meter to replace my ailing Daiwa. I’ve used the old Daiwa for years, and it has served me dutifully, until recently. Lately, though, the forward power indicating needle appears to have reached an invisible barrier on its way up, and stops dead in its tracks at about the 25 watt level. 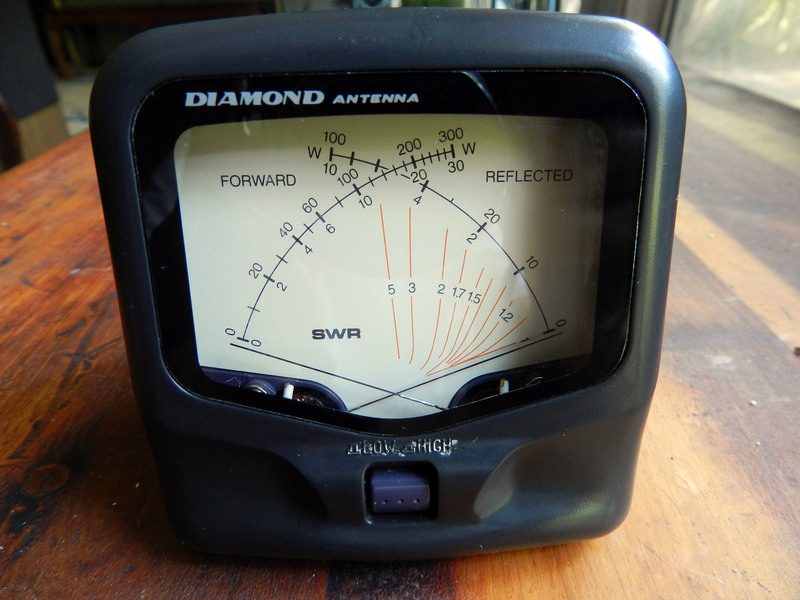 I’m still able to measure reflected power with the Daiwa, and to utilize my trustworthy MFJ antenna tuner, but not knowing the relative output power was troubling. I’ve not previously attended the Cullman, Alabama Hamfest, but given my need for an SWR power meter, today’s spectacular July weather, and the delightful fact that my XYL agreed to accompany me, this seemed an ideal opportunity to attend my first. I was reminded on the way northward toward Cullman that I live in a truly remarkable state. From the tranquil and picturesque Gulf Coast region, through the bucolic flatlands of the central portion of our state, to the awe-inspiring majesty of the hills and mountains of north Alabama, the diversity of the landscape here is stunning. I couldn’t help but wonder if this fact entered into the consciousness of the countless travelers racing along Interstate 65 with me this morning. Or were they only aware that Alabama is green, really really green this time of year? So we arrived at the Cullman Hamfest venue, after an uneventful hour or so jaunt up an incredibly active Interstate, only to discover not a single legitimate vendor in attendance, not one. I had no illusions of seeing Icom or Kenwood there, mind you, but I still expected someone selling new gear or coax. Instead, the half-filled Civic Center complex looked just like a traditional bone yard with an abundance of old 2 Meter radios, several Browning Golden Eagles, and an assortment of gear that would have done any Novice proud back in 1960. Undaunted, my wife and I did the Hamfest shuffle, which to the uninitiated is a sashay up one aisle and down the other, nodding politely as you go and speaking to those familiar. And there was a sizable contingent from Birmingham too, which made for pleasant camaraderie … but nary a sole new equipment dealer, and no SWR Power Meter in sight. And just as we were prepared to depart the scintillating company of a few hundred or so of our fellow Radio Amateurs, I spied it. In an unassuming corner of a sparsely filled table of eclectic radio bits and pieces, was a meter. As I reached to examine it, the gentleman bellied up to the rear of the table exclaimed, “It works!” And with those reassuring words, I proceeded to inspect the meter. It appeared quite similar in construction to my failing Daiwa, and had a white scrap of paper taped to the bottom. $20 was all it said. Even at the paltry price, I was still unsure if this was the meter for me, and carefully removed the price tag to reveal the specifications printed beneath. “3.5 – 150 MHz” it read, “Diamond CX20C”. “Can you make change for a 50?” I asked, and then our deal was struck. I contemplated my good fortune during the soporific return to Birmingham. Just when I had all but abandoned hope of finding what I came for, there it was right in front of me. I supposed this could be a metaphor for life as well. We’re always searching – for love or happiness or wealth, when very often just exactly what we need manifests itself, and frequently too when all seems lost. Note: The Daiwa works perfectly and reaffirms that my geriatric Icom 735 is still surprisingly spry for its age, radiating a whopping 110 watts on 40 Meters, my band of choice. Furthermore, the low power setting on the CX20 will be ideal for my refurbished HW-8. So when is the Huntsville Hamfest anyway?